We visit the Chinchero Archaeological Site, built by Inca Tupac Yupanqui in 1480 and consists of a set of elements and architectural spaces, such as pre-Columbian murals structures, enclosures, terraces, yards, stairs, temples, etc. We can identify the remains of three important huacas or temples whose bases are huge masses of rock called by tradition with its place names of Titiqaqa, Pumaqaqa and Chincana. They are huge limestone outcrops and there cupboards, canals, zoomorphic and all that would mean offering to their gods are appreciated. 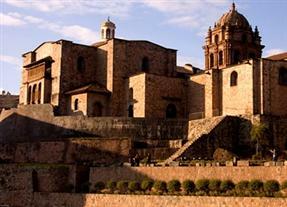 In Chinchero also we will visit the colonial church Nuestra Señora de la Natividad, that is located in the main square. 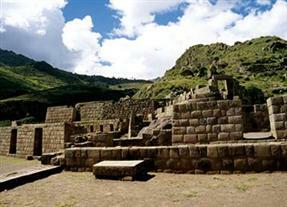 It stands on Inca walls of the palace of Inca Tupac Yupanqui. This also is an excellent example of the richness of churches of Cusco towns. The interior walls and ceiling are covered with murals of filigree and religious reasons. This and much more make the colonial temple of Chinchero unique in its kind. We can also explore the Chinchero Textile Market, a colorful craft fair that is carried out in its fullness on sundays in the main square in front of the colonial church. From early morning vendors come mainly from Chinchero but also from the surrounding villages to sell their handicrafts. The exchange of local products, for other products, utensils and items are also very common here. We can find here coca, coffee, tea, lemons and all kinds of fruits, etc. 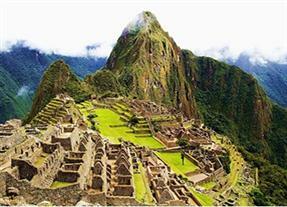 03 nights accommodation in Cuzco with breakfast included.